Eat, Drink, and Support Providence at Uncorked! 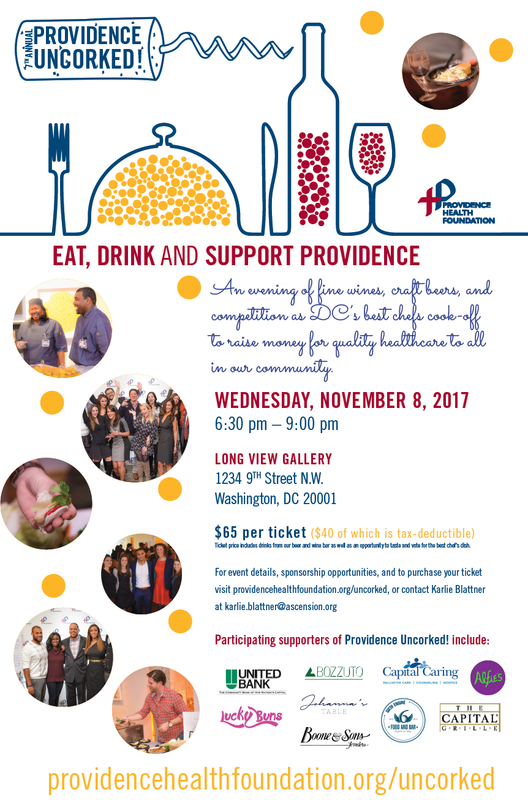 Providence Health Foundation is excited to host its 7th Annual Providence Uncorked!, a culinary celebration that raises funds for Providence to help provide quality healthcare to all in our community, regardless of their ability to pay. Taking place on Wednesday, November 8, 2017 at Long View Gallery, Uncorked! celebrates the District’s vibrant food scene as we invite some of our city’s finest chefs to join us and show their skills in a cooking-competition format. Each chef will prepare dishes for all attendees to taste, judge, and cast their vote to determine who will be named this year’s Providence Uncorked! Champion. Tickets to Uncorked! include unlimited drinks from our donated beer & wines bars, and tastes of food prepared by our participating chefs. Proceeds from event sponsorships and ticket sales will generate necessary funds to support Providence’s areas of greatest need in order to ensure our patients receive holistic compassionate medical care in a safe and comforting environment. For additional information about Uncorked! or to purchase tickets visit www.providencehealthfoundation.org/uncorked, or contact Karlie Blattner at karlie.blattner@ascension.org.